Note: With the exception of Love in Focus, these are digital-only releases. Having really enjoyed Nogiri-sensei’s That Wolf-boy Is Mine!, I was happy to see another of her titles get licensed. Alas, it’s another short series. Mako Mochizuki is entering her first year of high school and has been invited by her childhood friend, Kei Akahoshi, to attend a school almost four hours away from home by train. Both of them are really into photography, having been taught by Mako’s grandfather before he passed away, and this school has a photography club with a professional for an advisor. Furthermore, they both live in a boarding house occupied almost entirely by club members. The one outlier is another first year, an introverted guy named Mitsuru Amemura who claims to hate photos. I really enjoyed Mako as a protagonist, and probably will always enjoy a lead character who’s truly passionate about something (and good at it, too). I also liked that it’s the way she sees the world, and her ability to find beauty in the smallest things, that convinces Amemura to open up about his past and consent to be her photographic subject. I could definitely do without Kei and his pissy possessiveness of Mako (even if he did invite her because he understood how lonely she was at home without her beloved grandpa) and hope that we’re not going to be expected to buy into a love triangle scenario. It’s true there are shades of Shortcake Cake in this story, but it’s distinct enough that I intend to follow both of them. Also, this one has a really cute dog. 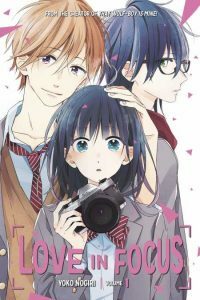 Love in Focus is complete in three volumes. Kodansha will release volume two in English in May. 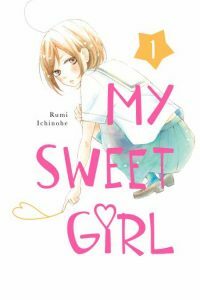 My Sweet Girl has a fairly generic premise: Tsugumi Koeda (her last name means “twig”) is a short, skinny girl who believes she’s not the kind of person who gets to fall in love. “No guy has ever looked at me as a girl in my whole life,” she narrates, but this changes when she meets popular Masamune Sena, your standard princely shoujo love interest, who inspires her to begin expressing her femininity more overtly. On the one hand, I liked Tsugumi’s insecurities about her physique and that she thinks things like, “I never, ever want to show my body to Masamune-kun.” Her wariness of being led on and her gradual realization that it’s okay to be more true to herself are good, too. On the other hand, the execution of this storyline at times leaves a lot to be desired. So many times, background characters will pipe up with cruel comments out of the blue and it feels so unrealistic. Like, random passing fifth graders berate Tsugumi for her appearance, and a group of boys who knew her in junior high interrupt her summer festival outing with Masamune just to call her a stick. We get that she faces some adversity, but this is verging on lame. Too, I lost track of how many times Tsugumi falls down, is knocked down, or passes out. It happens A LOT. There’s enough to like about My Sweet Girl to entice me to return for a second volume, but if she falls down half a dozen more times in that one too, I probably won’t proceed to a third. My Sweet Girl is ongoing in Japan, where the ninth volume has just come out. Kodansha will digitally release volume two on Tuesday. Are you despondent now that Kimi ni Todoke has finished? Are you looking for a series with a similar feel? Look no further, because Ran the Peerless Beauty is here! Ran Takamine is seemingly perfect. She’s beautiful, rich, extremely smart, and athletic. She’s also been deemed undateable, as boys are too intimidated to talk to her, expecting her standards to be sky-high. In reality, though, she’s a sweet girl who works really hard and is completely inexperienced with boys. When she accidently sprays Akira Saeki with a hose while diligently performing her duties for the Gardening Club, she’s surprised by how cheerful he is about it. Gradually, they become friends, bonding over their love of flowers. Akira’s father runs a flower shop and his ambition is to get good enough to create bouquets. Ran joined the Gardening Club to help “sensei,” but adds, “I had the feeling that I’d rather be around flowers than people.” Akira can see that, rather than being snooty, she’s just a bit awkward. What reminds me of Kimi ni Todoke is both Ran’s classic beauty and her attitude. Her male classmates won’t make eye contact with her, but not because they fear being cursed but because she shines too brightly, but she’s really just a normal person with her own weak points. Akira is sunny despite some scary family circumstances—it’s not until late in the volume that Ran learns his mother is in the hospital—and encourages Ran to come out of her shell a bit. I can see this evolving into quite a lovely story, and I am so here for it. I also hope to learn more about Akira, his circumstances, and how he sees Ran. We do at least know that their growing feelings are mutual, which is nice. 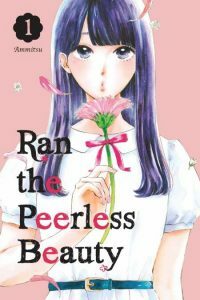 Ran the Peerless Beauty is ongoing in Japan, where the fifth volume has just come out. Kodansha will digitally release volume two later this month. The blurb for the first volume of World’s End and Apricot Jam wasn’t very encouraging. “After breaking into Anzu Shinohara’s apartment and smashing his already broken keyboard, Hina Sakata quickly finds herself in his debt. As she works to pay him back, Hina finds out that Anzu is a vocalist in a band and becomes entranced, wanting to explore more of his unkown world.” It’s all technically correct, but suggested to me something more Sensual Phrase-y than what actually occurs, to my great relief. Hina lives with her father, who is ostensibly the manager of an apartment building. He spends his days getting drunk, however, so she takes over his duties so that he doesn’t lose his job. One of their tenants is the slovenly guy in #304, who turns out to be a singer in a band. He’s also full of contradictions—and I don’t mean his transformation from “goofy weirdo” to “charismatic vocalist”—as he finds himself repeatedly drawn to Hina only to pull himself back at the last second. It’s true that Anzu’s indecisiveness plays with Hina’s emotions, but it does truly seem to be unintentional. He’s in his twenties and has done a lot of things that he’s not proud of. (“I’m no good and a liar.”) And here is this girl, so sweet and great, whom he comes to care for in a way he hasn’t cared for anyone in a long time, and yet… is it right to encourage her feelings when she’s an innocent and might be better off without the baggage of his past and his angst? Ultimately, I liked this series a lot more than I was expecting to. I also like that it’s a fairly short series; these sorts of scenarios can get tiresome when they go on too long. 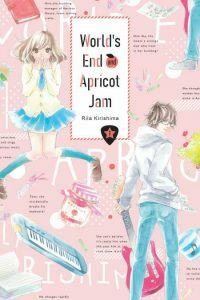 World’s End and Apricot Jam is complete in six volumes. Kodansha will digitally release volume three on Tuesday.